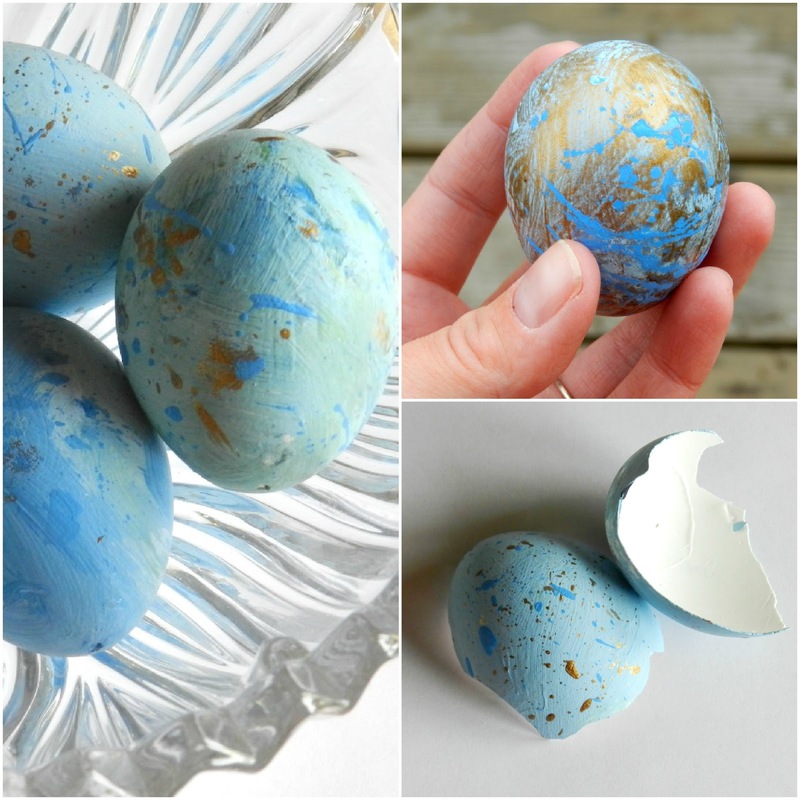 Here's a quick tutorial on how I decorated my first ever blown eggs! Step 1: On a paper plate or paint pallet, pour small amounts of acrylic craft paint and mix colors to get desired base color. I used a medium blue, white, and bright green for my base colors. Step 2: Using a foam brush, paint the base color(s) over one half of the eggs. Let dry and then paint the other half and let dry completely. You can paint one smooth color or blend in other colors to get a more varied look. Step 3: Lay eggs out on paper towels. Cover your work area well... this gets messy! Load up a paint brush with the paint color of your choice. Hold the paint brush in one hand next to the eggs and with a finger, flick the tip of the brush to splatter the paint onto the egg- Jackson Pollock style! Step 4: Let each side of the eggs dry before turning them over to flick paint on the other sides. Then let dry completely. Your'e done! Quite aside from the gorgeous eggs, you have mentioned from time to time about migraines. Have you read the book, "Foods That Harm, Foods That Heal"? It's worth a shot. I just had that thought cross my mind as I was commenting on another blog about diets and health. I have never heard of that book, but I think I will check it out. Thanks! I've had migraines ever since I was in a car accident, so it's mostly related to my back muscle problems. I haven't ever been able to link my migraines to any foods, but that book seems like it's worth looking into. These are absolutely stunning, Elise. I love how you'll be able to decorate with them year after year, too. Thank you for sharing with us. Also, I wanted to invite you to join my How To Tuesday link party, if you haven't already joined . It would be wonderful to have you! I have those on my to do list for easter! Cool! I'm sure it's worth the effort to blow your eggs if you are going to make them look that nice. Maybe I'll try it this year. Wow, these are stunning:) thank you for your sweet comment this morning! Those look fabulous! Awesome job! Just letting you know that I featured your amazing project today. Thanks for sharing it on The Inspiration Board and have a wonderful weekend. These are some of the prettiest and creative eggs to pop up in the crafty blogisphere in a while! Absolutely beautiful. And they just HAVE to be a ton of fun! Definitely giving this a try! Thank you! Those eggs are so pretty, I want to make some now. Thanks for sharing. Stunning eggs! Thans for sharing!